Last Week in Review: Housing prices and consumer inflation tick up, and confidence is high. Forecast for the Week: The February Jobs Report may show a lot to love, or not. View: Email openers that win business. “What’s wrong with being confident?” Demi Lovato. Consumer Confidence hit the best reading since July 2001, while home prices and consumer inflation have also been on the rise. Housing prices posted strong gains through the end of 2016. 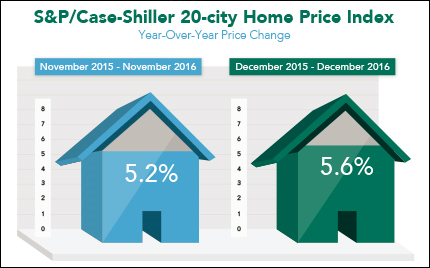 The S&P/Case-Shiller 20-city Home Price Index saw a 5.6 percent annual gain from December 2015 to December 2016, as low housing inventory continued to fuel rising home prices. Within the index it showed that Seattle, Washington; Portland, Oregon; and Denver, Colorado had the largest year-over-year gains. Pending Home prices, which is a future-looking indicator based on contract signings, were down a disappointing -2.8 percent in January, below the 0.9 percent expected, per the National Association of REALTORS®. December Pending Home prices also were revised lower to 0.8 percent from 1.9 percent. In economic news, the second reading of fourth quarter 2016 Gross Domestic Product (GDP) matched the first reading of 1.9 percent, just below the 2.1 percent expected even though consumer spending surged. GDP is the value of goods and services produced by the nation’s economy and it’s considered one of the broadest measures of economic health. Inflation data ticked up in January as Core Personal Consumption Expenditures (PCE), which strips out volatile food and energy prices, rose 0.3 percent from December. The headline PCE index (which includes food and energy) rose to 1.9 percent year over year, the biggest 12-month gain since October 2012. Higher inflation can take a toll on Mortgage Backed Securities, reducing their value and negatively affecting the home loan rates tied to them. The record high Stock rallies experienced with the Dow, NASDAQ and S&P 500 also weigh down Bonds. For those in the market for a new or existing home, home loan rates remain in historically low territory despite recent market volatility. If you or someone you know has any questions about current home loan rates or products, please don’t hesitate to contact me. What direction will the 2017 job growth trend line go after a strong start in January? Economic news kicks off on Wednesday with the ADP National Employment Report and Productivity numbers from the fourth quarter of 2016. On Friday, look for the Jobs Report for February, which includes Non-farm Payrolls, Average Hourly Earnings, the Unemployment Rate and the Average Work Week. As you can see in the chart below, Mortgage Bond prices were driven downward recently as Stock markets posted record highs. Despite the volatility, home loan rates are still in attractive territory. “I can help you solve ______ by ______.” Chances are yours isn’t the only email your prospect will receive today. Jumping right into your value proposition and providing immediate proof with reliable data is a winning opening. “Is ______ a priority for you right now?” Starting with a question gives prospects something to think about and respond to. If they reply, you’ll get a sense of their needs, so you can tailor a specific response. “Congratulations on ______.” Whether your prospect has started a new venture, won an award or made a company change, this line is a great way to kick off an exchange with other professionals or potential referral partners. It shows you’re celebrating and care about their success. “I came across this blog post/e-book/case study/infographic and thought you’d find it valuable.” This can be one of the most effective ways to reach new prospects, referral partners or even existing clients you’ve been meaning to get in touch with. You’re adding value and demonstrating your professionalism and care. Think of the opening line of your next email, and use it to drive reader’s curiosity into the rest of the email to find out what’s next. Check out this link for even more email opening lines. Feel free to forward these helpful tips to your team, clients or colleagues.